"State Establishment Order, no. 1, for the year 1948". The People's Administration, Legal Department. "Confidential, Seventh Proposal". May 14, 1948. The State Establishment Order was the first legal document of the State of Israel, drawn up by the People's Council and People's Administration a few hours prior to the Declaration of Independence. 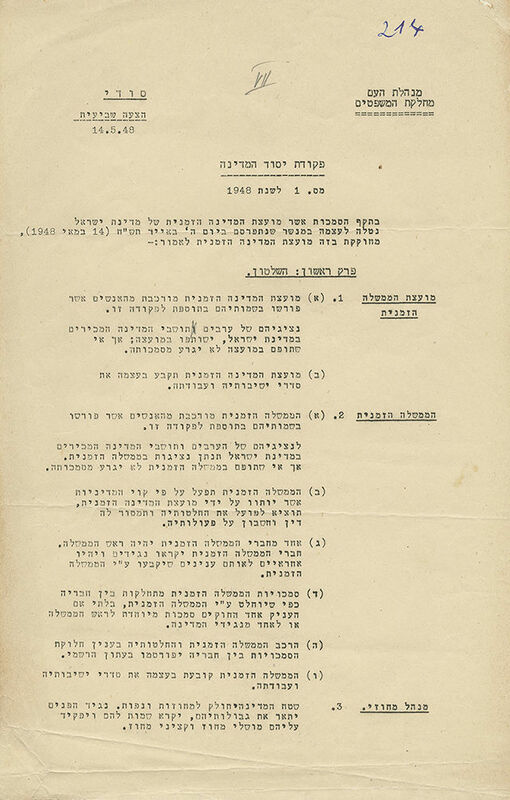 The document was formulated at a meeting held at the JNF House in Tel Aviv (the same meeting in which the decision was taken to establish the State of Israel, and the formulation of the Declaration of Independence was agreed upon), and it regulates the operation of the three branches of the new state: "the Government" (the executive branch), "the Legislature" (the legislative branch) and "the Law" (the judicial branch). In addition, the document addresses the establishment of courts, a police force, budgets and other issues. The present document is the order's seventh draft, typewritten and mimeographed, and it includes several amendments and erasures in pencil. leaves, 33 cm. Good condition. Creases to corners and bottom margins. Some stains. Small tears to margins, restored. A note in pen at the top of the first page.